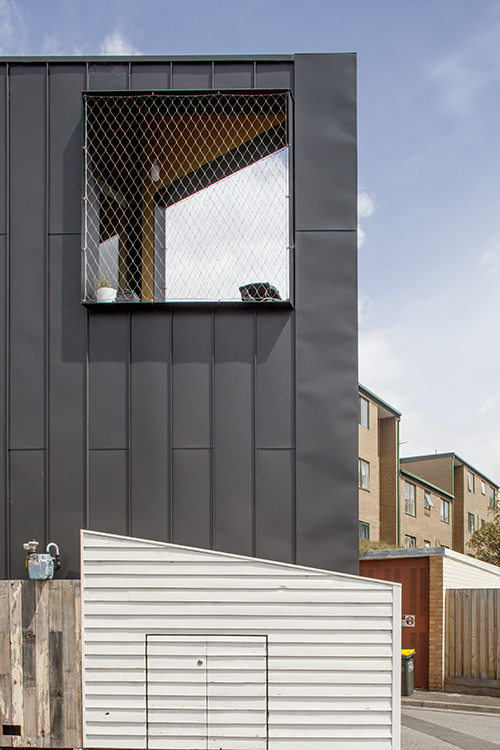 A Victorian weatherboard cottage, although charmingly decrepit, was considered a beloved landmark for residents in Albert Park, an inner suburb of Melbourne; however, this cottage presented a host of design challenges when it came time to restore the structure’s liveability. Even though the original structure couldn’t be saved, OOF! Architecture conceived a replacement that preserved its eccentric character, combined with a distinctive contemporary edge. Both the clients and project architect, Fooi-Ling Khoo, were captivated with the personality of the battered little house, and they committed to carrying over some of its weathered quality to the new structure. The cladding was removed for reuse, as were miscellaneous fittings, including door knobs, vents and street numbers. The new house was oriented differently on the lot, but the gable form of the original was retained. 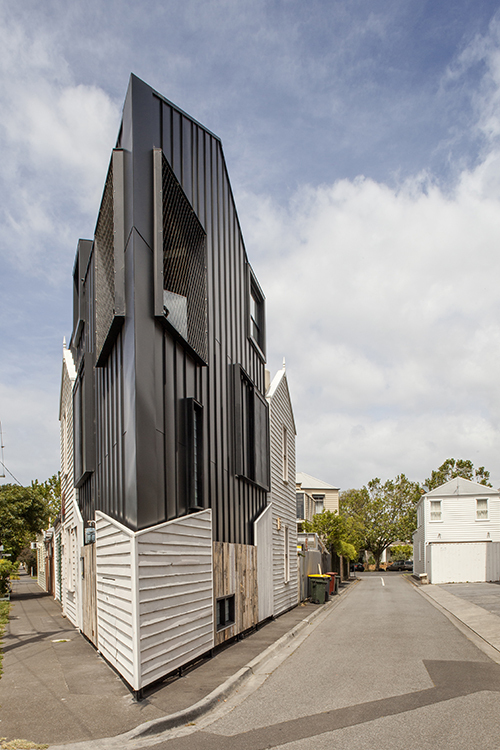 The tiny lot – 48 square metres – and its triangular shape presented a major constraint for the layout. In response to space limitations, a split-level design was devised, locating living areas on three levels, connected with a staircase. 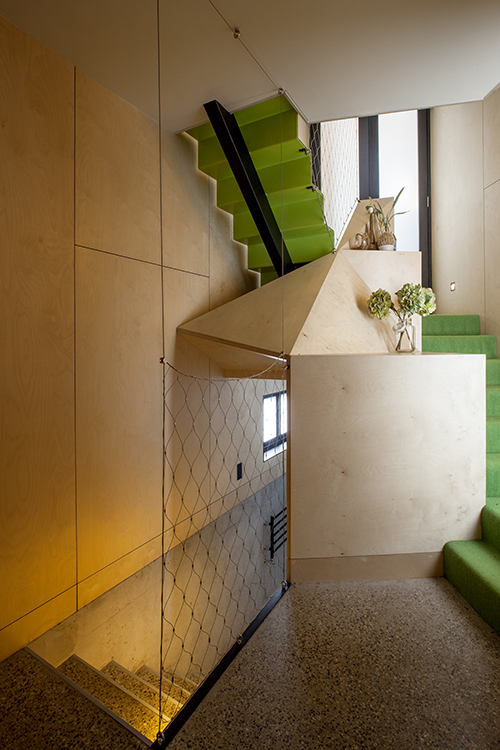 The staircase separates uses and provides privacy, so that valuable space isn’t taken up for internal walls, corridors and doors. The perception of a more spacious environment is facilitated with continuous circulation throughout the house, reducing physical and visual obstacles. Town council permitted 100 percent lot coverage, due to the site limitations of the lot layout, but that meant no outdoor space was available for the house. Instead, when full-height sliding doors and screens are opened, the main living area becomes a verandah; a sharply angled but roomy outdoor balcony provides another connection to the outdoors. 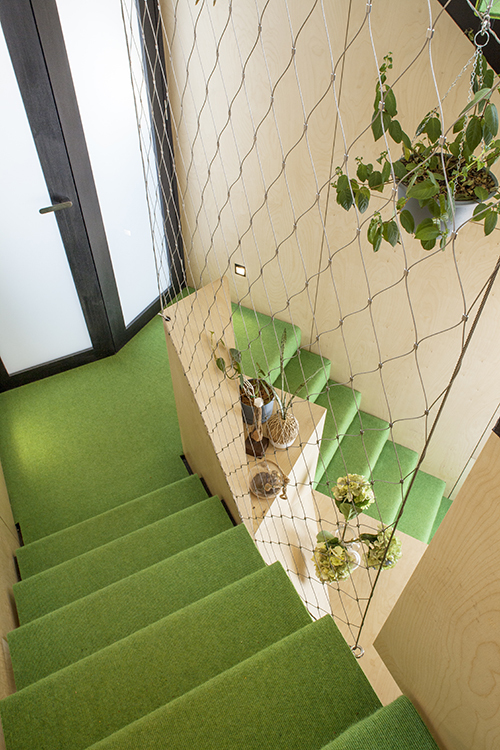 Suitable for outdoor and indoor applications, Tensile’s webnet mesh was used throughout Acute House, with compatible and cost-effective results. The 316-grade stainless steel wire is pliable and strong, properties that allow it to conform to any shape, while complying with safety regulations for fall protection. 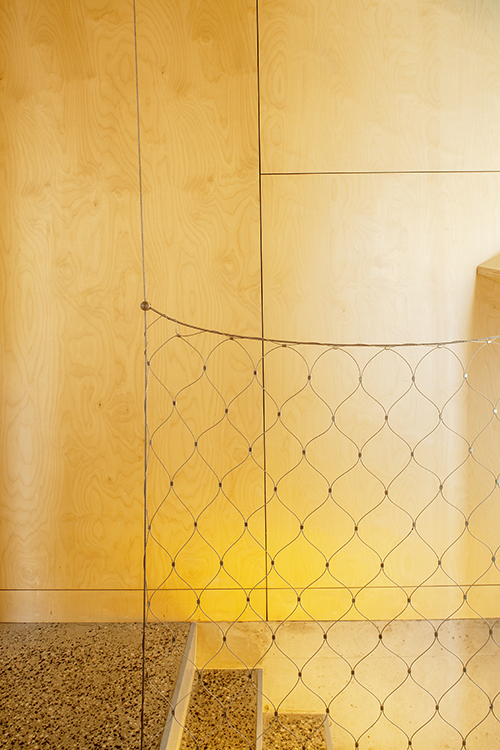 A 100mm aperture webnet mesh with 1.5mm wire with 6mm perimeter cable was used on the project. 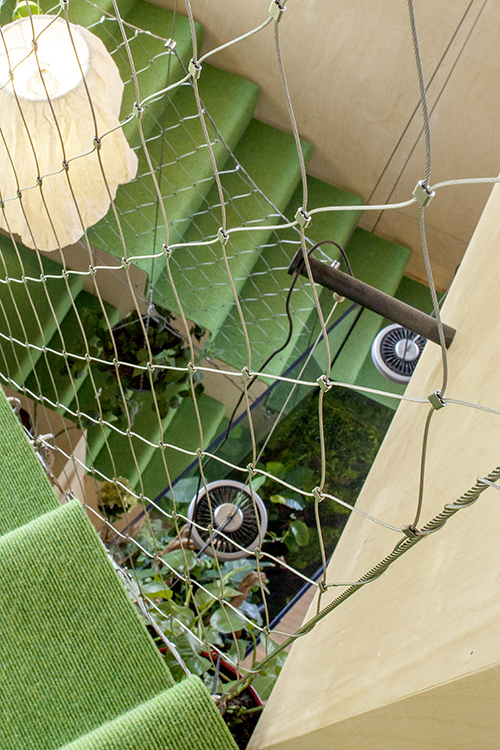 The mesh proved to be the ideal barrier material for the staircase and balcony, as well as more conventional use as a protective shield for windows. 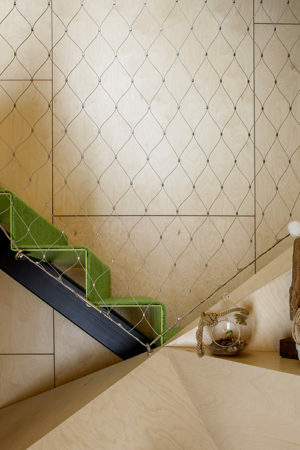 An additional benefit was the ease of installation for the unusual angles of the structure. 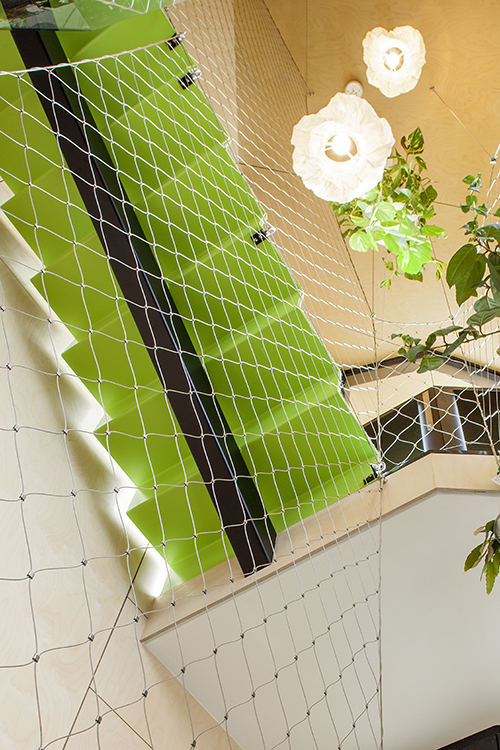 The versatility of webnet mesh extends to its visual quality. 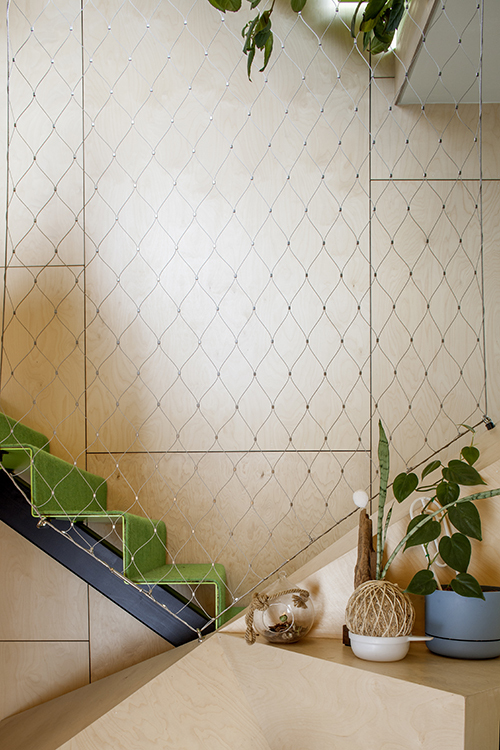 The transparency of the mesh helps meet the design objectives of minimizing visual barriers in Acute House and allowing light to enter each part of the space. 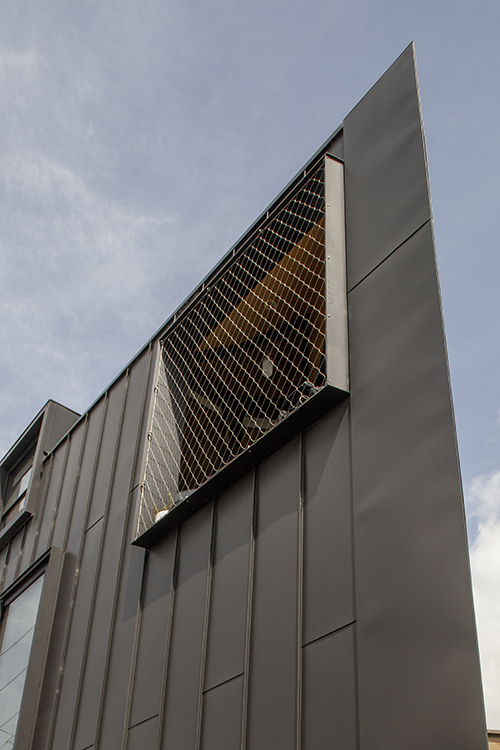 The delicacy of the mesh pattern blends seamlessly with the metal and salvaged wood of the exterior façade and fits comfortably with the restored hardware fixtures inside the house, successfully bridging the fusion of heritage and contemporary design.